After the slab is removed and the earth excavated to the right level, the underpinning of the walls can commence. 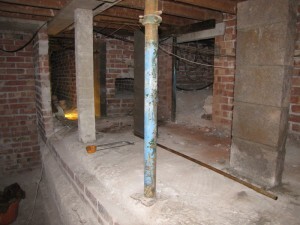 The photo above shows the first corner section of underpinning complete. Each section is approximately 1200mm long and is cast in alternate sequences. 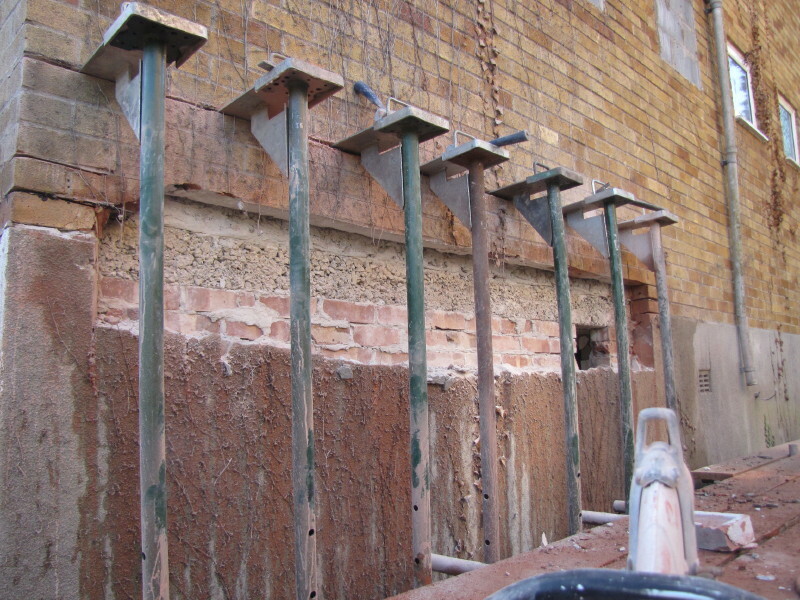 The photo shows the form-work for the second section being removed, the third and fourth sections (either side of the second) can be cast in one sequence, as per the structural engineer’s details. 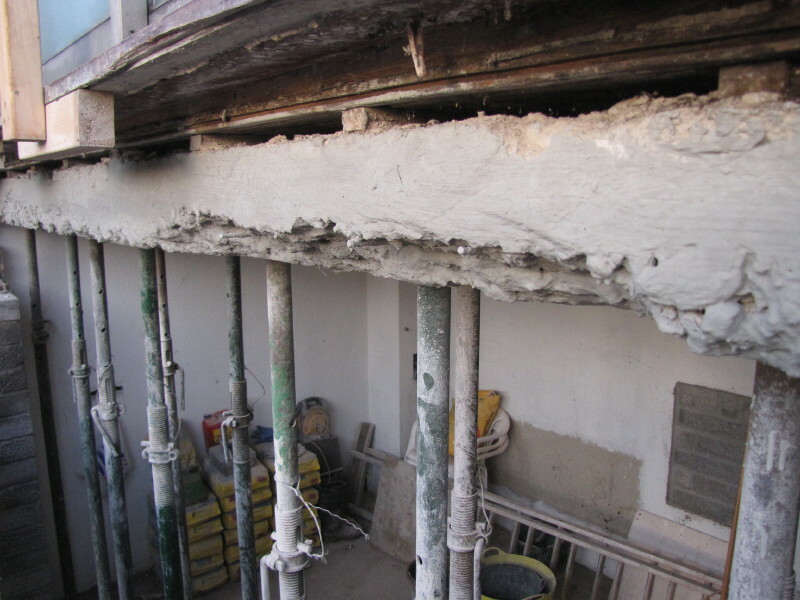 The underpinning will continue along the internal side wall (behind the column in the photo) and progressively along the external side wall (far right in photo) in tandem with the excavation along the wall. Let’s hope for good weather! 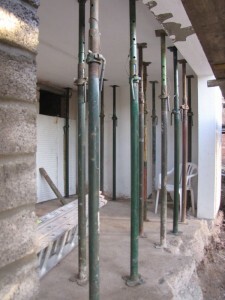 The picture shows the extent of the steel work now that the scaffolding has been removed. Toward the base of the new steel column, you can just make out the thermal break. 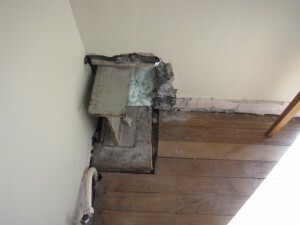 The new insulated floor level is approximately 30mm above this break, and so the existing needs to come out. Concerned that a breaker drill will cause too much vibration (and noise), it is decided that a concrete saw would be best. 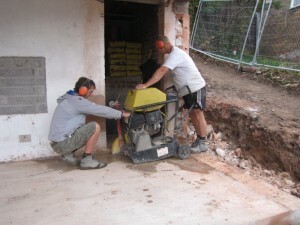 This will cut the slab into chunks of manageable size for the digger to ‘scoop out’. 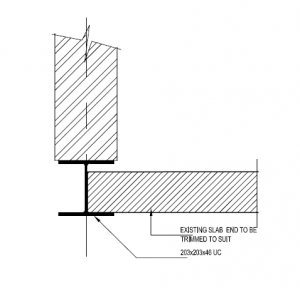 In addition to the Acros and Strongboys, a further steel ‘needle’ was inserted to the external corner and another steel placed beneath the slab to spread the point load. 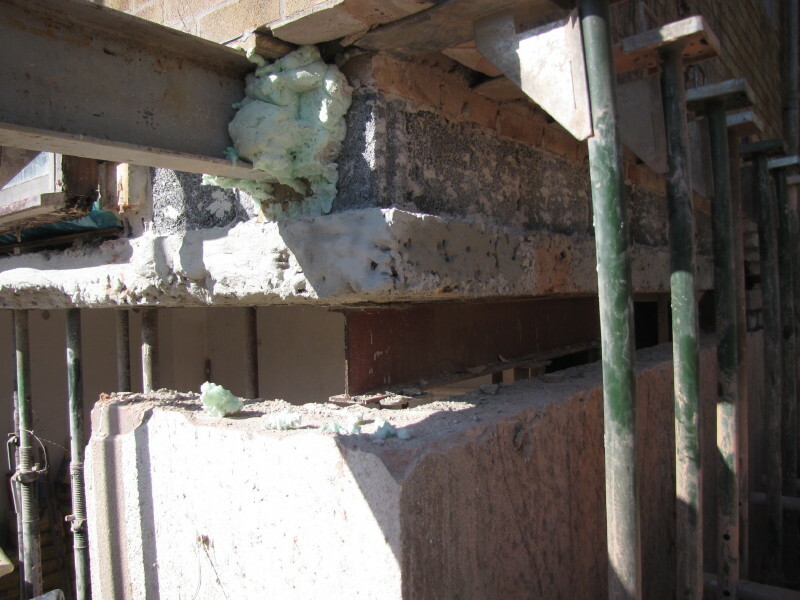 After a few more checks and tightening up of the supports, the concrete lintel beneath the slab was cut out and the side wall partially demolished, exposing the edge of the slab in readiness for the steels. 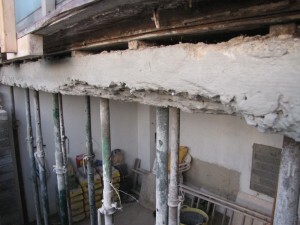 As we are relying on this edge (structurally: the slab sits into the web of the steel), we need to strengthen it using Sika Armocrete repair mortar. 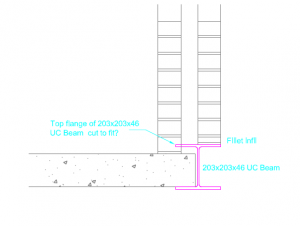 As a further precautionary measure, the bottom flange of the steel will be extended by 100mm to make sure it reaches sound concrete beyond the edge. Scaffolding went up on Tuesday followed by the installation of an array of Strongboy supports and Acro props in preparation for the demolition of the side wall and removal of the concrete lintel at the rear, which supports the slab above the former loggia. The picture above shows the matrix of Acro supports. 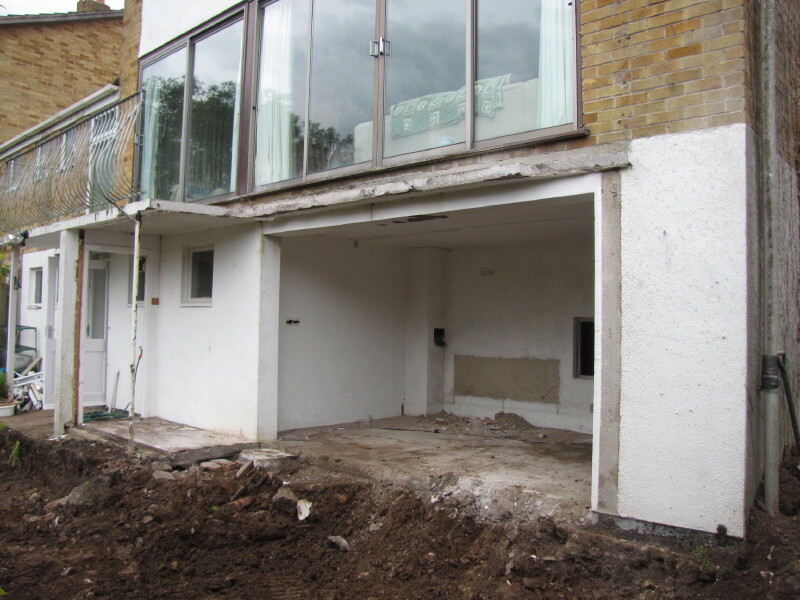 The concrete lintel being removed (with white render coat) is just visible at the top right of the picture. 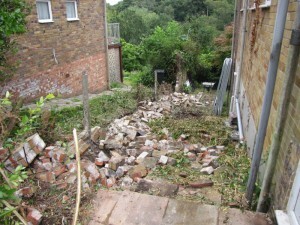 Now ready for some serious demolition! 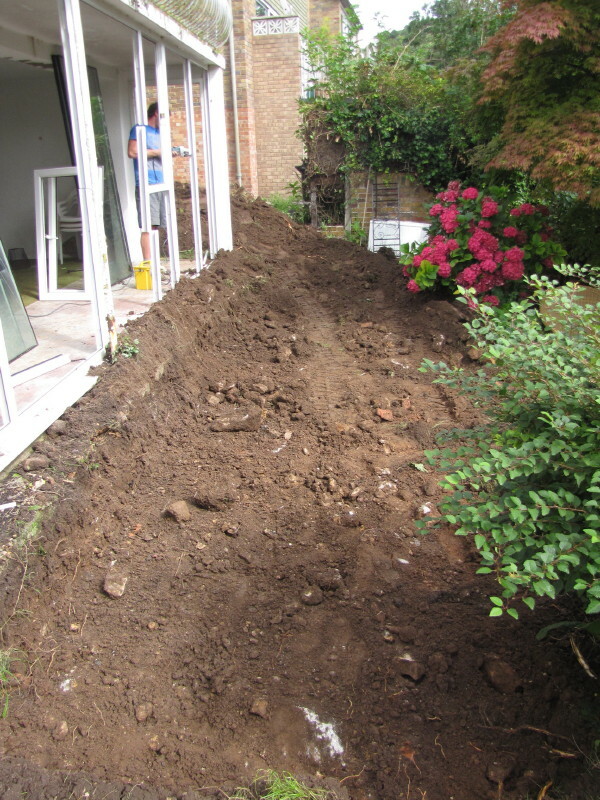 There is a vast void beneath the house, thanks to the slope that the house is built on. In its present state, it cannot be effectively used due to the amount of structural walls and supports. Some of these are now being demolished and replaced with lintels on block piers. 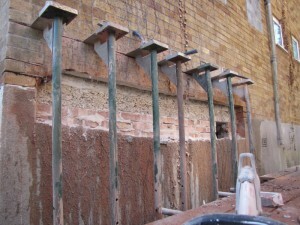 The photo above shows the block piers constructed on top of the existing retaining wall. Elsewhere, access hatches are being cut into the walls as can be seen in the photo below. 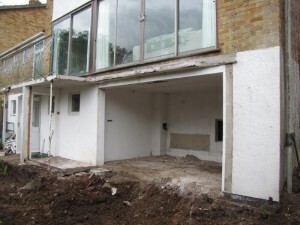 Opening up under the house in this way allows the space to be used more effectively. 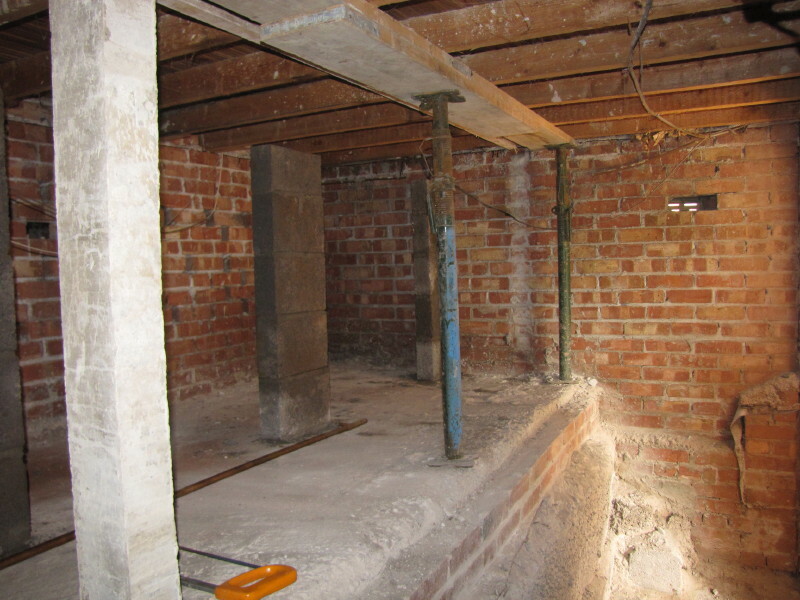 The part of the void in the photos (with the greatest headroom) will be part of the heated volume of the house and will become a plant room for the hot water cylinder and an archive/storage area to house items currently in the loft. 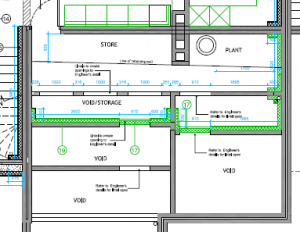 The loft will be almost unusable for storage due to the amount of insulation proposed and its low (22°) pitch. The void will also enable good access for installing the new services: pipes, cables, ducts, and will be excellent for getting the floor insulation into the unheated part of the void toward the front of the house where it becomes more of a crawl space. 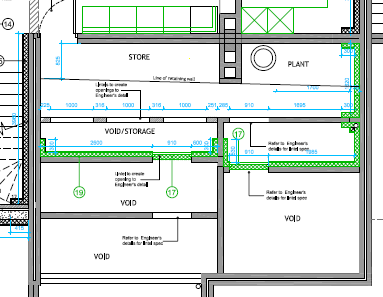 The drawing extract below shows the extent of the void and the delineation between heated and unheated areas (insulation and air barrier line shown in green). 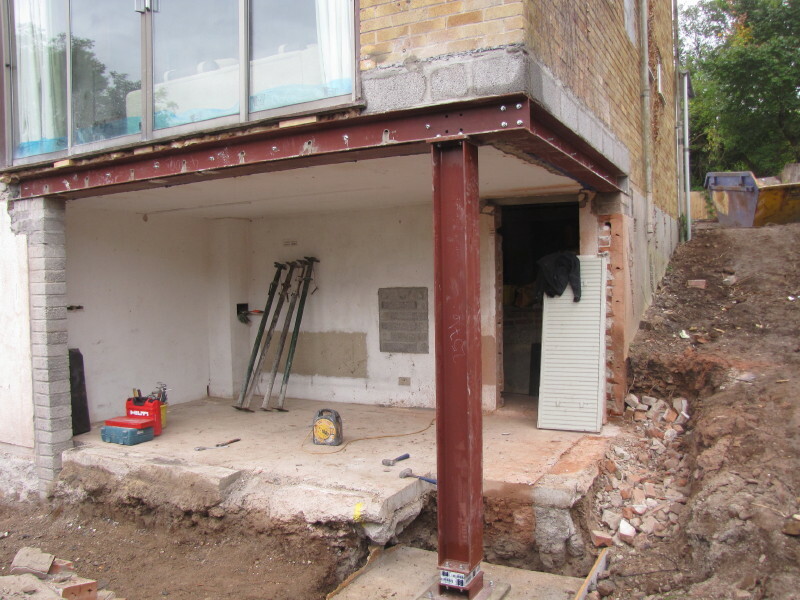 In meeting the structural engineer, it was agreed that the lower ground slab should stay for the time being as it will be easier to temporarily prop the upper slab from this. 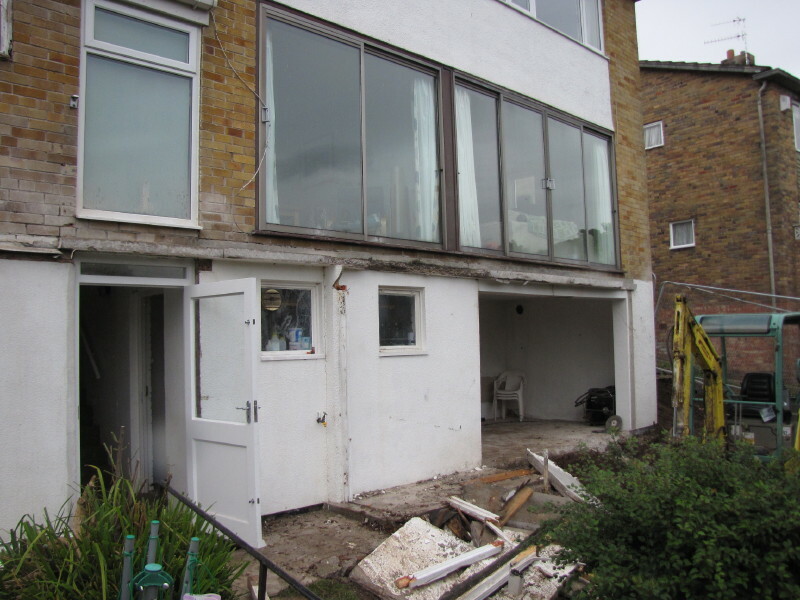 In the meantime we have been deciding the best approach for the main structural alterations and the insertion of the steels. 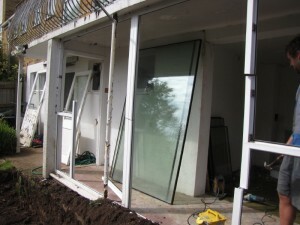 First of, five of the seven side windows have been in-filled, the remaining two will come out later. 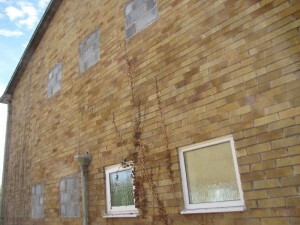 In-filling the windows will strengthen the wall prior to the demolition of the lower section of this wall. Exposing the slab edge reveals that it is supported entirely by the inner brick leaf. 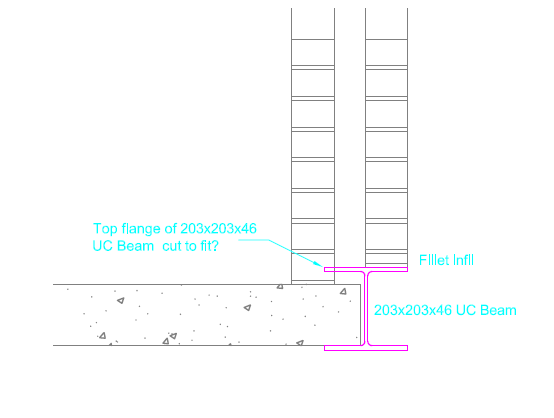 This makes the sequencing simpler as the slab can be supported as proposed, with an array of Acro supports below. The outer brick leaf will need supporting independently, but there is not as much load to contend with as we thought. 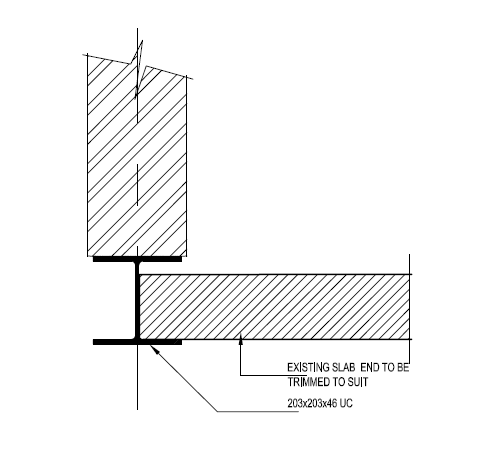 As the sketch detail above right shows, we have a slight clash with the proposed steel now and we will need to trim the top flange such that it doesn’t foul the inner brick leaf. 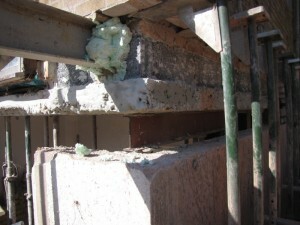 Our structural engineer is okay with this providing we bolt the web of the steel to the edge of the concrete slab. The cast-in-situ concrete balcony has been removed along with the ground-bearing slab beneath. 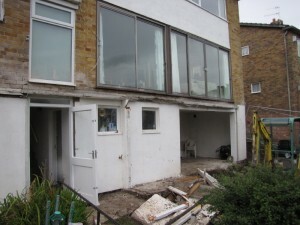 After the balustrade had been removed, the balcony was cut-off with a wet cutting saw in sections. 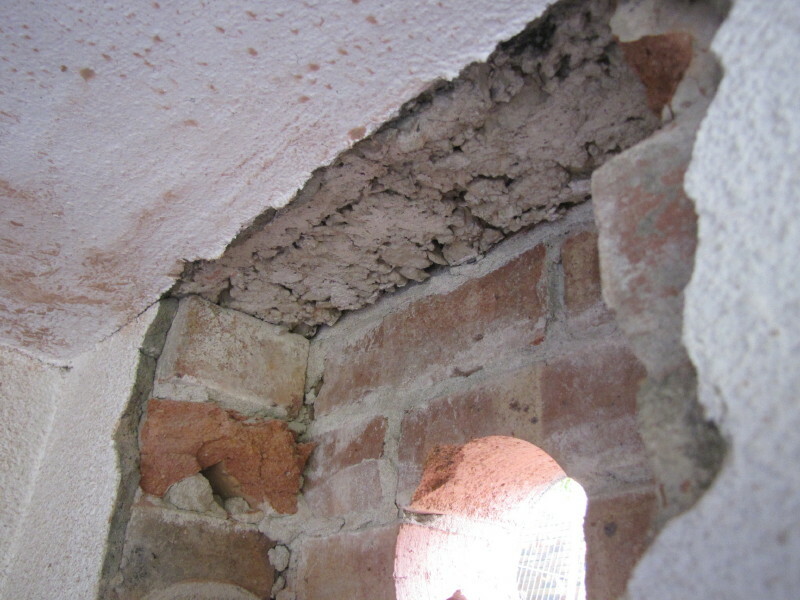 The plan is to cut the remaining protruding section flush with the face of the brickwork and expose the lintel so that we can plan the steel fabrication works. 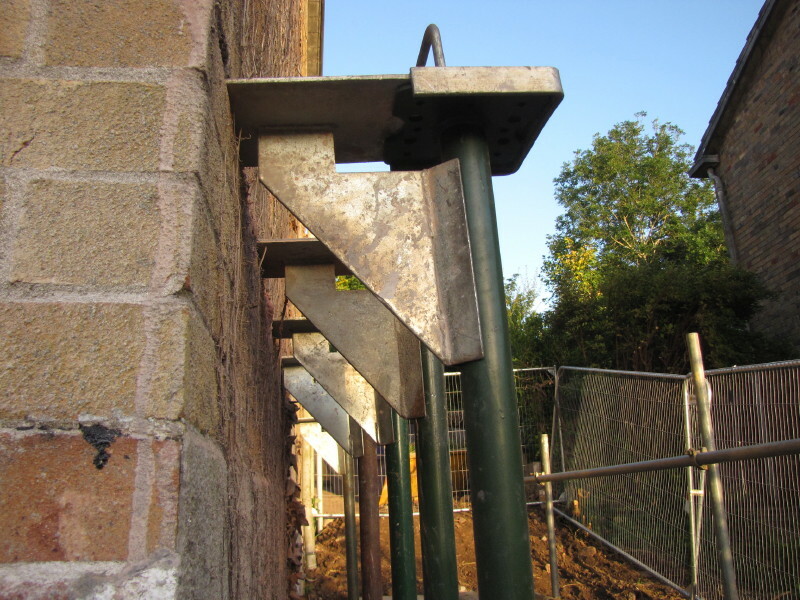 The web of the new steel will take the weight of the existing slab (as shown above left), but the sequence will need careful planning as the steel will support the wall structure above too. 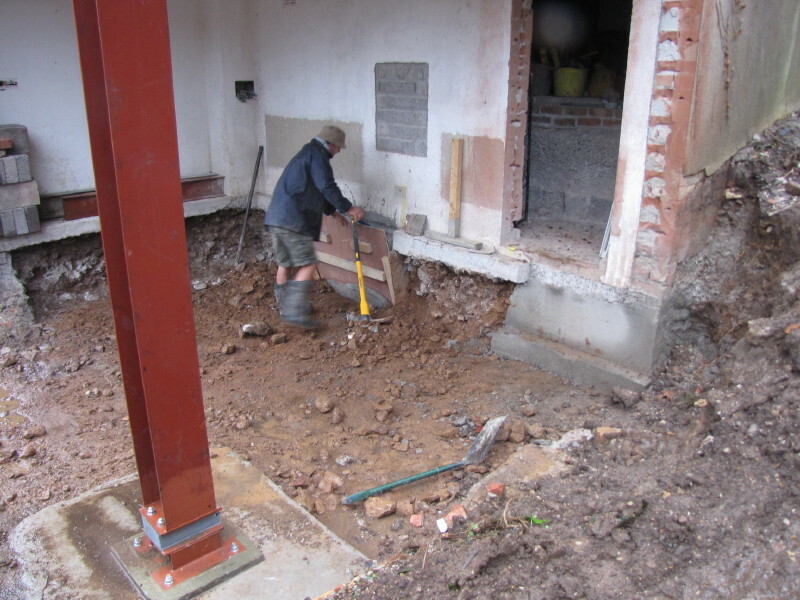 Furthermore, looks like we have a raft foundation on the lower ground slab, so cutting the slab away may need a bit more planning. We are putting a new steel column at the corner of the house as shown (in green) below.This will require a new concrete base, but we need to sequence the demolition and temporary bracing of the existing house very carefully. A bit of head scratching at the moment: a number of potential solutions, but probably only one right one. Structural engineer is visiting first thing Tuesday…continues with next week’s update. 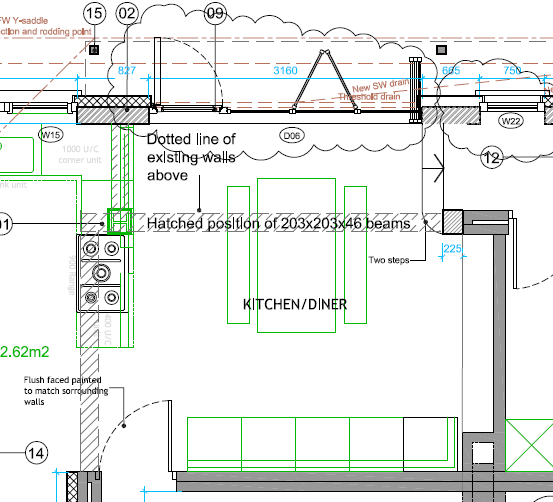 It’s been a long time coming, but finally we make a start on site this week. 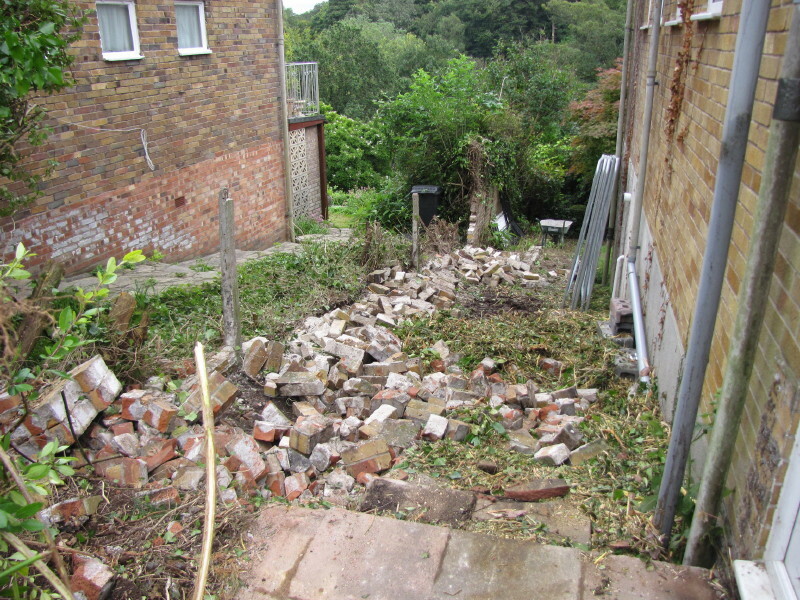 First couple of days was given to shrub clearance down the side and demolition of the garden (party) wall as shown in the photo above left. 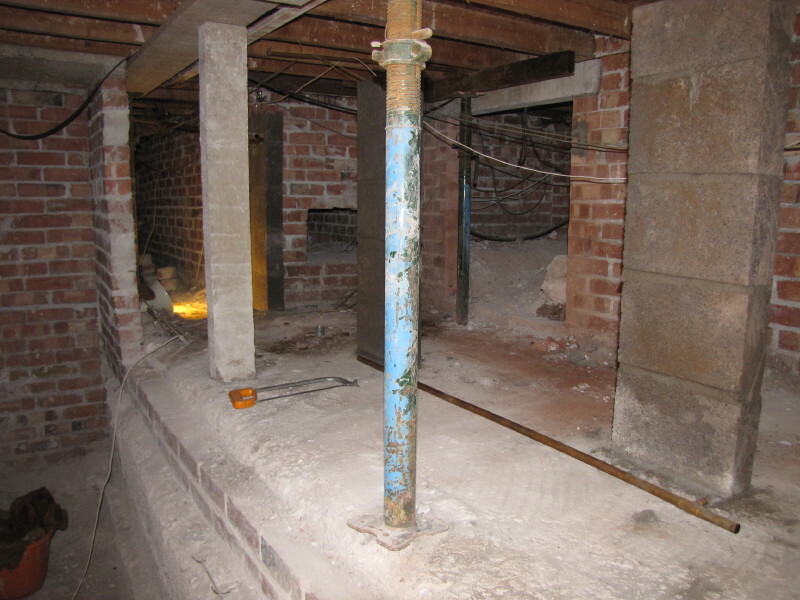 Ground levels were lowered at the rear of the property by approx 600mm as shown above right. This will be a future terraced area and the intention is to flush the external level with the internal finished floor. Day three saw the PVC windows beneath the balcony removed in readiness for the demolition of the balcony. Initial attempts were made to remove them carefully for re-use elsewhere, but with the best will it was not possible due to the amount of adhesive sealant, which meant that the frames warped and twisted as they came out. The solution was to cut them into sections and set aside for collection by a specialist who will process them into chip granulate for re-manufacturing into plastic construction products.